excellent hair cut and treatment by staff. very friendly and helpful. very happy with hair cut. Jack hair stylist/ hairdresser is very tallented. After many years of crying or being angry after leaving the hairdresser's I have finally found the place where, in terms of hair, dreams come true. Today is the third time I've gone to the Hare and Bone and after having a full head of highlights and a cut and blow dry I can say that I am thrilled. The colour is *perfect* and the cut is exactly what I wanted. Nathan is the most elegant and quickest of hair stylists, he is very nice and considerate too without overdoing it with chat or inappropriate questions. I can't wait till my next appointment! Thanks Nathan and the rest of the team, you rock! The right place to go to if want to look awesome! I tried plenty of places in london but you wouldn't be able to find any other salon which would provide such a great costumer service and professional stuff. The moment you walk in you are in the lovely friendly atmosphere where stylists, reception team and specialy Amy :) actually cares about you, they don't rush and always alow enough time to make sure your hair looks the way you want. Have been going to the salon since it opened and I gave never been disappointed because everyone always takes so much care and attention to get my hair absolutely right. All the staff are friendly and attentive and the atmosphere is unpretentious and relaxing -I look forward to my visits. Would unreservedly recommend the salon. Hi Lin, many thanks for your review, we look forward to welcoming you back soon. 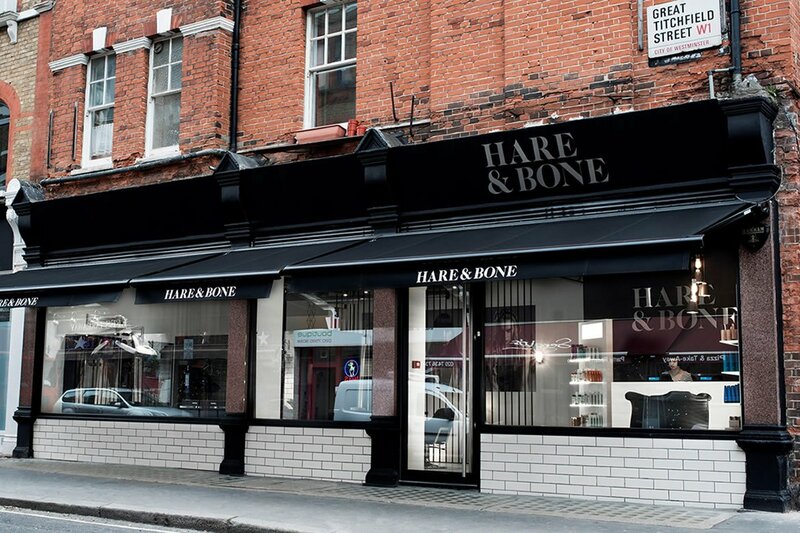 Just come back from having my hair cut by Sam at Hare & Bone. Absolutely amazing, Sam is a miracle worker, unbelievably talented, went in bedraggled with bushy frizzy hair have come home with the most amazing hair cut with soft smooth hair. All the team there are hugely welcoming with a warm super friendly atmosphere. This is my find of the year and I will be going back back and back again & again and again :))) thanks all at Hair & Bone ???? As per usual Emma did a brilliant cut. Great place to go. This was my first time st the salon and it was great, great place, great people, great experience, great haircuts! Defiantly go again!!!!!!!!! Very impressed as always with today's cut, service here is great- really recommend Amy who always listens to what you want and tailors products and treatments to suit your hair type. Sam, as always amazing cut, not nice, simply awesome! The staff are friendly from the moment you walk in. For such a prestigious and award winning salon, there is not a hint of pretentiousness to be found. I have been twice now, once for a cut and then for a colour - both with a stylist who listened to what I asked for and outdid my expectations for both. I feel very well looked after when there too - with back massaging chairs while my hair is washed to complimentary tea or wine! Perfect place for pampering and to unwind. I am so happy I found this salon & never want to leave! Sam has great knowledge in cutting curly hair. Very happy. He's simply the best! This salon ticks all the boxes; great team; great stylists;just right atmosphere and, most importantly,I've never had a bad hair day since going to them ! Esther is the most artistic, professional, charming hairdresser ever. I have very difficult hair which many hairdressers have been at a loss to tame and shape and I have used many many hairdressers in London who have failed miserably. From my first visit a year ago it has never been a problem for Esther an I am eternally grateful. Excellent service as usual from the team. Sam is the best stylist in the world! First time having hair cut by Amy - love it, great shape and flattering. Next appointment booked already.